Hinged, lockable double doors, 9’1” x 16’4” apex metal garage, this product is a perfect place to keep your car safe or you could also use it as a workshop and or storage place, the garage come flat packed and step by step illustrated instructions. 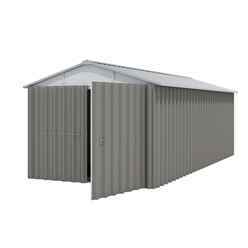 Manufactured from high quality hot dipped galvanised steel they are coated with a polymer. No painting, preserving or rust proofing is ever required.